The Kubota M7 Series tractor is impeccably designed to provide commercial hay producers and row crop farmers with a fuel-efficient, high-performing and versatile tractor. 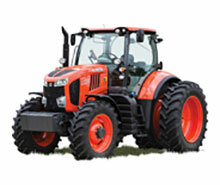 This commercial tractor is ideal for hay and forage applications, livestock operations, row crop production and more. The M7 invokes a robust stature that includes a 10-bolt heavy-duty front axle. This heavy-duty front axle complements the best-in-class lift performance of the LM2605 front loader, providing the operator with a durable and highly efficient tractor/loader combination. IDEAL FOR HYDRAULIC-DRIVEN AND COMMERCIAL EQUIPMENT: The M7 Premium Series provides a CCLS (Closed Center Load Sensing) hydraulic system ideal for equipment utilizing hydraulically driven components. It features hydraulic flow rates fully capable of supporting planters and other applications demanding high performing hydraulics. The M7 Series tractor can support a variety of tasks, including: Round Baling, Planting (Planter), Tillage, Loader, Mixer Wagon, Grain Cart. SOPHISTICATED CONTROLS: K-Monitor Pro (Premium and Premium KVT Models) – The best-in-class K-Monitor Pro provides the operator with touchscreen accessibility to many of the M7’s configurable features. ISO-BUS Connector-Compatible – The M7 is an ISO-BUS equipped unit allowing ISO-BUS connectivity to ISO-BUS compatible implements, allowing implement control via the K-Monitor Pro. KUBOTA HEADLAND CONTROL: The M7 Headland Management System, Kubota Headland Control, works with ISO-BUS compatible implements to provide customizable programs of fully automated operations. This allows one-touch control to a pre-set sequence, significantly reducing operator workload to minimize operator fatigue and enhance productivity. Kubota’s customizable Headland Management System makes headland turning easier and more responsive while an ISO-BUS monitor/controller and GPS/auto guidance system contribute to greater working precision. HYDRAULICS: Premium and Premium KVT Models – The M7 premium model offers premium CCLS(Closed Center Load Sensing) hydraulics, providing high and variable flow rates ideal for applications requiring a high performing hydraulic system. PTO: Kubota's standard 4-speed live-independent PTO (540/540E/1000/1000E) gives you the ability to operate a variety of rear-mounted implements at the optimum speed for each, resulting in lower operating cost/fuel consumption. Auto PTO on/off with 3-Point Hitch Position* automatically disengages the PTO when the linkage is raised, then re-engages when the linkage is lowered, increasing operator efficiency. EZ-COMMAND CENTER: The EZ-Command Center enables effortless access to many of the tractors functions. This reduces operator fatigue, resulting in a more comfortable, productive, and efficient operator’s environment. Plus, an ergonomic workstation engineered with instantly accessible levers and information centers make for a comfortable days work from the M7's wide cabin with virtually unobstructed views. KUBOTA V6108 ENGINE WITH POWER BOOST: The V6108 engine boasts the latest in clean-engine technology providing a high-level of performance, while adhering to emission regulations. Power boost delivers more power when additional power is needed to operate and maintain maximum efficiency within travel and PTO applications.